With timeless appeal and an endless array of options, Schrock has just the right offering of rich finishes and specialty techniques to transform your space into a unique expression of your personality. Stains are applied to cabinet doors to enhance the natural beauty of the wood, while also adding beautiful color. 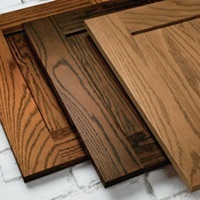 A variety of stain applications are used across our cabinetry brands. Cabinet stains can range from light to very dark. Light stains will allow you to see more of the wood's natural character, while darker stains will hide much of the grain, but can create richer color and a more dramatic look. Matte Sheen* - From lipstick to home goods to appliances, matte finishes are showing up everywhere, and our cabinets are no exception. Available on any stain, any species and offered at the same price as our current Satin sheen, our new Matte sheen top coat absorbs more light for a softer, more natural appearance. Satin Sheen* - Our original top coat features a moderate sheen which is reflective without being too glossy for a timeless, subtle effect. Available on all stains, glazed stains, paints and glazed paints. Paints are applied to cabinetry products when the desired look is an opaque-colored finish. When using a painted finish on tighter grained types of wood, you will be left with a smooth finish. On coarse-grained wood like oak, the grain texture will be partially visible under the finish. 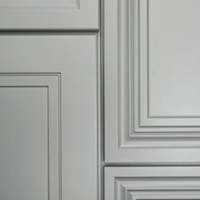 Glazes are meant to highlight the different edges on a piece of cabinetry. They can be applied to both stain and paint finishes. There are two types of glazes: flooded and penned. 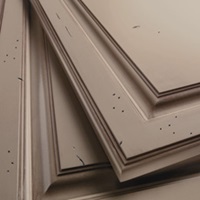 In the flooded glaze process, the glaze material is sprayed onto the entire cabinet door and is then wiped off everywhere except in the highlight areas. In a penned glaze process, the material is hand-applied to only to the highlighted areas. Techniques like sanding edges, distressing the finish, or adding dents and gouges to cabinets, can create a worn-in and perfectly aged look. 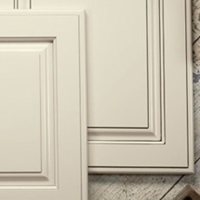 Finishing techniques are a great way to give your cabinets a truly unique appearance.